This natural source multi-mineral supplement provides natural-source ingredients, including minerals not found in most multis, in highly bio-available form, plus a spectrum of plant-source trace minerals. 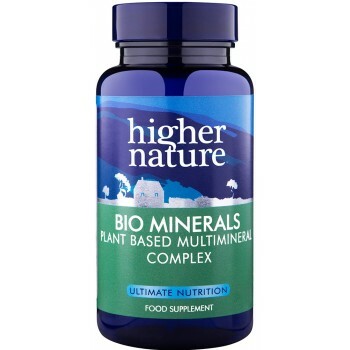 Higher Nature Bio Minerals may not be suitable for people with a fish or crustacean allergy. 20mg Spirulina, 20mg Alfalfa, 20mg Hyssop, 20mg Parsley, 20mg Carrot, 20mg Watercress, 20mg Fennel, 20mg Dandelion root, 20mg Coriander, 10mg Broccoli, 375mg Calcium, 8mg Iron, 124mg Magnesium, 8mg Silicon, 10mg Zinc, 30µg Iodine, 1mg Copper, 50µg Selenium, 4mg Manganese, 10µg Molybdenum, 50µg Chromium, 1mg Boron, 50µg Vanadium. Sugar, soya, wheat, gluten, yeast, lactose, dairy products, artificial preservatives, colours or flavourings.